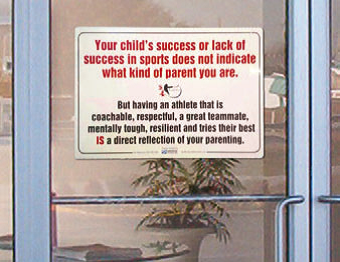 Are You and Your Child Coachable? BY TOM CURRY Colleges today may want to recruit a certain student athlete to fit into their program. But remember that the student and parent must be able to fit in with the program. must be able to take coaching. The student and parent must be able to fit in with the program. If not, the coaching staff may begin to change their idea about the young man or woman and go in a different direction and find another player to fit their school. play at the next level, whether scholarship or aid, would you want that parent at your games having every move questioned? the defensive end of the basketball court. The bench is a great teacher so that’s where he ended up. • Is your child a good teammate? Does he or she encourage their fellow team members or do they openly criticize them and their play? to leave the basketball game. I can only wonder if that will continue into the college setting. • Do you support the students and coaching staff publicly, or is criticism the first thing that crosses your mind? If all a child hears is criticism, then expect all them to do is criticize. remember that the student and parent must be able to fit in with the program. VITAL SIGN: It may not be necessary for most parents reading this column, but others may need a reminder about how we go about our business at youth sporting events.